Play action passes are not any different than drop back passes when it comes to the fact that you had better be on the same page as your offensive line coach when it comes time to install them. Let’s face it, the real work is being done by the big guys up front. The only thing more difficult than pass setting and keeping your quarterback clean for four seconds so they can complete the pass is first faking a run block and then protecting your quarterback. This is why you will often hear an experienced offensive line coach teach his players to aggressively sell the run fake at the point of attack but on the back side they are taught to hedge their bet a little and maintain a pass protection posture. It is also very important that the offensive line coach understands the route concepts involved with the play action pass. Not all play action passes are created equal when it comes to the timing required to get the pass off, just as they are not the same when it comes to drop back passes. 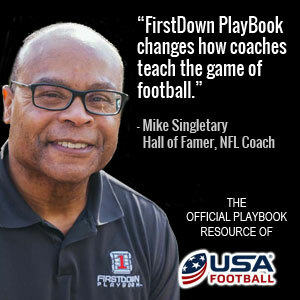 Today’s FirstDown PlayBook coaching video looks into this a little as we show you three distinctly different play action passes that come off of our new Two Back Open installation. The point we make today is that your offensive line coach had better be in the loop when you are installing any kind of pass play and that includes play action passes.